Our mainstay Collection, the Regis All Weather Wicker Chaise Lounge is perfect for any setting, commercially or residentially. This All Weather Wicker chaise is fully woven over tubular aluminum frame, making this chaise one of our most popular. 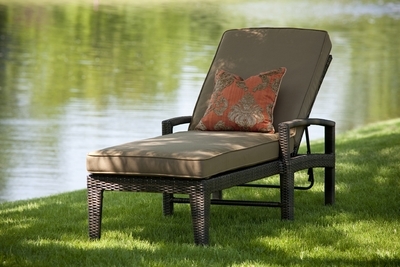 It comes in the Viro wicker color Prussian Dark Bronze and comes with a 5" thick Sunbrella fabric Canvas Cocoa cushion.